Next month, April 5-8, is the ISC West Show 2011 (International Security Conference) in Las Vegas at the Sands Convention Center. This year, like every year since HauteSpot Networks started in 2005, we will be attending. This year we are forgoing a booth in favor of a hospitality suite at the Palazzo hotel where we will have a complete test lab set up including various megapixel cameras, our wireless routers and our new microNVR wireless NVR. Getting away from the show floor allows us to have more productive time with our customers where we can talk without the din of the crowds and where we can spread out to show our products in action. If you would like to get together to see our new products or discuss your project requirements, just send a note to sales@hautespot.net with times that you are available. We will be demonstrating our new TDMA Like Protocol (TLP) version 2 running on our WRAPSXC and WRAPDXC routers, proving interoperability with several megapixel cameras including the Arecont AV10005 10 megapixel and AV8180 multi imager MJPEG megapixel camera (both of which represent the most challenging wireless cameras to support in the industry), the new ClearPix line of megapixel cameras from DVR Distributors and more. We will also be announcing and demonstrating the new microNVR wireless NVR. 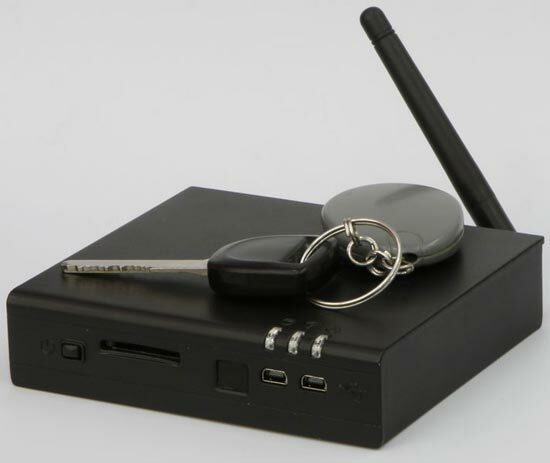 This amazing new device is only 4"x4"x1", runs on 12VDC, consumes only 10 watts, yet combines our full feature HauteRouterOS router capability, embedded high capacity storage (up to 500GB), and your choice of Windows or Linux operating systems with complete Video Management System (VMS). We built this product for law enforcement to install on motorcycles or to be worn. But the applications for it are immense. By combining a complete wireless router (which is capable of bridging, routing, meshing, providing user authentication, monitoring system health, and much more) with a complete PC operating system platform we are delivering a solution that is unlike anything else in the industry. 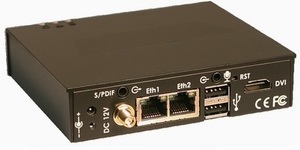 It is ideal for mobile and distributed edge applications. The system has an integrated 1080p capable video adapter so you can display your high resolution video on any high quality monitor. We are in the process of testing the microNVR with a number of different megapixel cameras and Video Management software solutions. Many of these will be on display at ISC. We realized that the microNVR needed a wireless camera that could be paired with it. 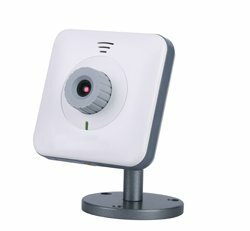 The new IPCamVGA is a compact, light weight, fully wireless H.264 camera with integrated SIP VoIP support. The camera runs from 12VDC and consumes only 2.5watts, making battery power practical. What is really unique about it is that it is a fully functional Voice Over IP device. So you can integrate it into VoIP phone switches. This is ideal for use by police, fire, ambulance and public transit agencies and can be directly integrated into VoIP dispatch systems or bridged to Land Mobile Radio systems. Combining the microNVR with the IPCamVGA into a wireless video system allows you to create innovative and cost effective solutions for mobile, nomadic and small fixed wireless surveillance solutions. For example the microNVR can be mounted on a police motorcycle with the officer wearing a battery powered IPCamVGA and a couple of IP cameras or even USB Webcams mounted on the bike. The officer could roam away from the bike and still have live video recorded and backhauled to supervisors. When the officer returns to the police station, the HauteSpot high speed wireless would automatically transfer the day's video wirelessly from the bike to the station. For public transit the microNVR and IPCamVGA could be quickly and easily installed on buses without any wiring. Same for small stores, homes, or almost anywhere. Adding to the tremendous success of our WRAP STATION LC line of low cost, all in one (antenna and router) station routers for wireless video, we will be demonstrating the new 5GHz MIMO version. This solution delivers excellent performance when paired with one of our WRAPSXC or WRAPDXC base station routers. Ideal for megapixel camera networks and it uses our TLP protocol for reliable video performance. We will also be demonstrating the SentinelAVE (Augmented Virtual Earth) 3D visualization product. This amazing tool allows live video and data to be overlaid onto 3 dimensional maps and models, creating a highly intuitive and fully immersive video information management interface. You have to see it to believe it. We are bringing several of our team members with us, so that our customers can meet our team in person. Mike Baron and Max Bateman from Technical Support, Charlotte Powell from Sales Operations, Charlotte Chang from Marketing, and Wes Simpson from Business Development will all be there. We invite our customers to arrange for meetings with any one of our team members. Come up to the suite and relax. It is just a short walk from the show floor and we will have refreshments and snacks too. Again, if you would like to get together to see our new products or discuss your project requirements, just send a note to sales@hautespot.net with times that you are available. We hope to see you at ISC West. Please let us know if we can meet you there. Awesome technology. Hope you have a great show in Las Vegas. Second that Bob. Here's to an amazing show! Bob... Let's talk soon. I'm 99% certain that with 30 minutes of you hear with our cool new toy, we could have our cool new toy humming along smoothly on it. Would be a sight to see. Besides, a bunch of cool new cosmetic upgrades for you to see.